As some of you know, we love trying out different natural foods here at Budget Earth. Unlike most other dogs I have owned or known, Reya very quickly gets tired of her kibble. So tired, in fact, that she will sometimes flip it over or try hiding the food in hopes we will give her something else. When we start seeing this, we know it is time to start experimenting with different foods, to find the new ‘right one’ for our girl. While we were at BlogPaws, Reya tried some treats that drove her absolutely wild from Wellness Pet Food. 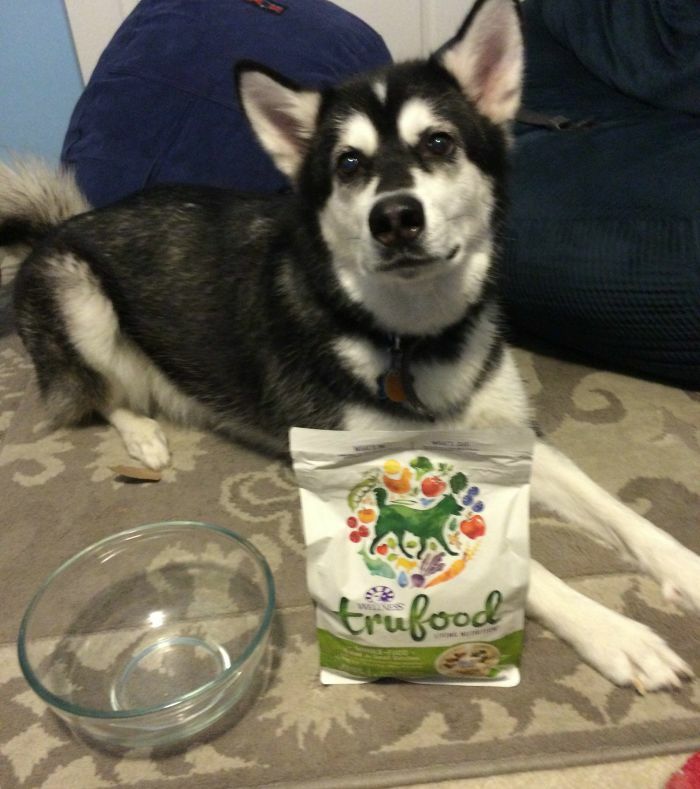 Curious to know more about their food, we reached out to Wellness, who sent Reya a variety pack so she could try out their new line of TruFood for herself! So, what did Reya think of this food? For our review, we tried the Lamb, Chickpeas, & Turkey Livers Dog Food. I have to say though from the moment I opened the bag, Reya was interested. Before I could even pour some of the food in our bowl to try, she buried her muzzle in the bag itself and wanted to eat it RIGHT THERE. Not just eat it, she wanted to inhale this food. This was very surprising to me, since I have never seen her react this way to kibble. She really LOVED this food. Even crazier, she normally isn’t a huge fan of lamb or chickpeas – didn’t stop her! What was the biggest dissapointment was that the bag didn’t last as long as she had hoped. She actually tried picking up the trashed bag and bringing it to me, telling me something was wrong! We are definitely going to be looking further into this food. 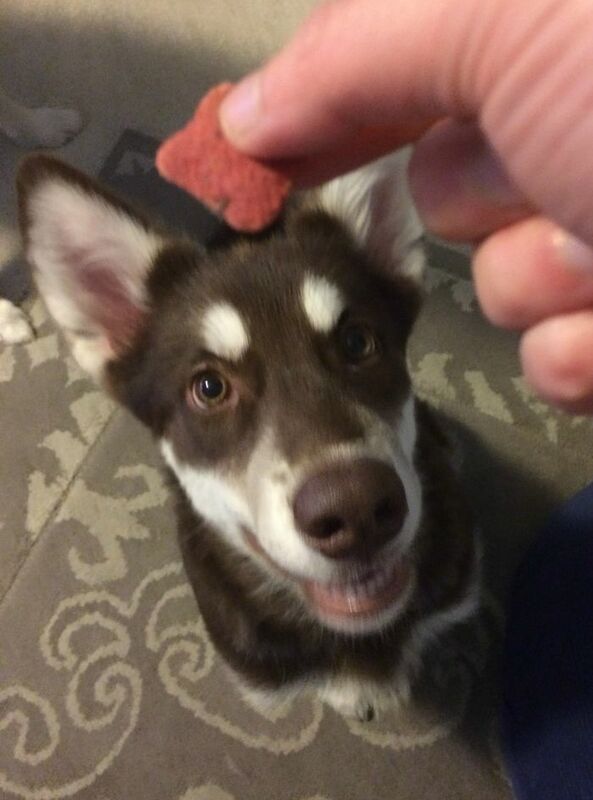 Based on our own experience, we are happy to give Wellness TruFood Baked Blend Dog Food an A+ rating and very highly recommend it to our readers! While these are more snack-sized for Reya, I have to say she went crazy for this food. Before I go any further, I should say this: Reya has always been very picky with wet food. I have had times where she took a taste of a food and actually ran upstairs to hide. With this wet food, she was hooked the moment she tasted it. Both varieties of this food she tried, she absolutely loved, and was ready to eat the container, if given the chance! My only disappointment was I didn’t have enough for the Ivi bitty puppy to try, since Reya ate the WHOLE thing! Based on our own experience, we are happy to give Wellness TruFood Tasty Pairing an A+ rating! Before this review, my girls had the opportunity to try a sample size of these treats. From the moment Reya tried it, she was hooked and BEGGING for more. Ivi was no better, and trying to crawl in my lap to get into the little bag out of my hand. When my girls saw these treats were back they were VERY excited. To say the least, we are very excited to see the girls still love them and are planning on buying more of these awesome treats at PetSmart. Based on our own experience, we are delighted to give these treats an A+ rating and highly recommend them to our readers! 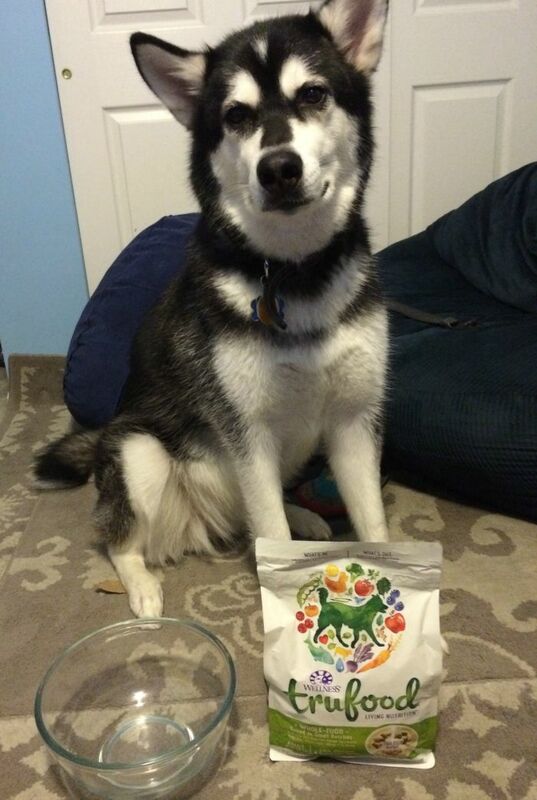 Want to purchase the wonderful foods featured in this review for your own dog? You can find the full Wellness TruFood line at your local PetSmart, Petco, or see if it is sold a store near you using the Wellness store locator. You can also buy their food online at Amazon.com or Chewy.com! Want to learn more? Check out Wellness on social media! I really want my dog to try this brand. I love that it’s natural and grain-free. I think it would be easier on my tummy. I have been looking for a new dog food for a long time for my dog. It looks like I found it. I really liked that the food was natural and grain free. 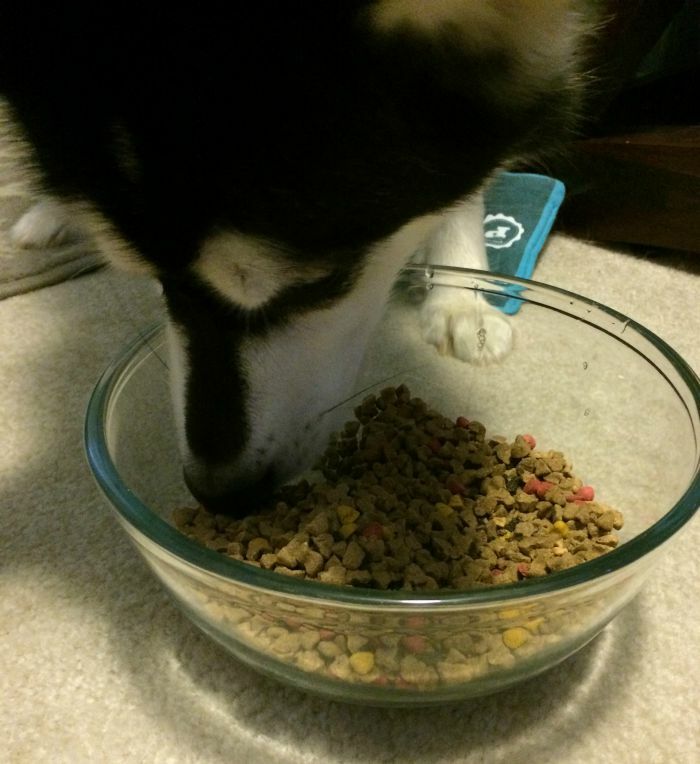 Too many dog foods have added junk as ingredients that is unhealthy and unsafe. I definitely want to try and I found a store near me that has it. What a beautiful dog, so cute. I have been looking for a better food for my dog and this one sounds like it is worth trying. Thanks for the great review. Might let my dog give this a try. I like that it is slow baked in small batches. When I had a dog there weren’t any natural dog foods. Glad these pleased your pups. I would certainly feed this to Mike my senior dog. He gets only natural ingredients in his food. I’ll have to look into this brand as we have a dog who has stomach issues. He would love the Carrots, Salmon, & Cod! 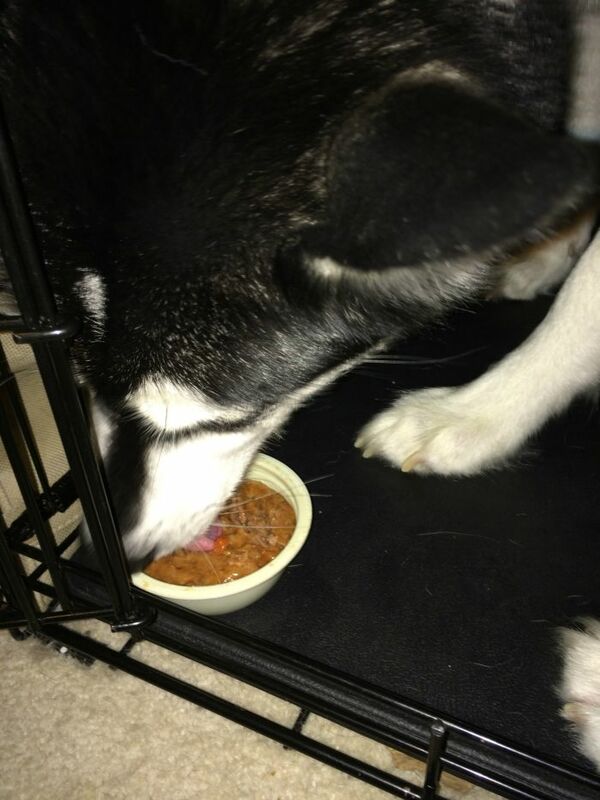 The Wellness TruFood Dog Food sounds great, it appears that Reya and Ivi certainly enjoyed the food they tried. The food combinations sound delicious and the Wellness TruFood CocoChia Bakes sound yummy. Thank you for sharing this review. This is very cool. As a huge animal person and in college to be a Vet Tech I really care what my animals ingest. This looks like it’d be a good product to try out and research. It looks like your pup pup gives it a rousing endorsement. I would want the one with the cocounut oil because Sunny has such dry skin. I have not had a dog since I was a child. Dog food,has made great strides and I like the idea of adding coconut oil to the Wellness TruFood products. Sounds like Reya is bit like my dogs that they seem to get tired of the same food. I haven’t tried any new kibble because I am afraid it will upset their stomach and give them loose stool. But I am loving what I am reading about Wellness TruFood. When we first got Lucas he was on Wellness but the regular one we moved onto Maverick because he its seemed like he didn’t like it. TruFood sounds like it is definitely a healthier diet I love that they have coconut oil in them. The TruFood is pretty amazing! We are trying the cats on it too but so far, Reya has loved everything she has tried in this line.